Jeremy’s status as a lamb fiend is well documented on this website, so it will surprise no one that he hovered over the legs of lamb at Costco until I agreed to cook one for him. He specified a braised dish this time, so after a cursory perusal of Epicurious turned up nothing but roasts, I turned to the tried and true: All About Braising . Trimming the lamb: If there is a whitish dry parchment layer on the top side of the lamb (known as the fell), trim it off by inserting a thin knife under it to loosen and peeling back this thin layer. Trim any excessively thick layers of fat from the outside of the lamb, but don’t be overly fastidious, and certainly don’t cut into the meat. You want to leave a thin layer of fat to protect the meat as it braises. Season the lamb all over, inside and out, with salt and pepper, re-roll it into a cylinder, and truss it snugly with kitchen string. Browning the lamb and building the braise: Heat some olive oil in a large enameled Dutch oven on medium high heat. Lower the lamb into the pot with tongs and brown it thoroughly, turning to get even color, 10 to 12 minutes total. Remove the lamb to a plate; add the wine to the Dutch oven, set the heat to high, and bring to a boil. Reduce wine by about half, 5 minutes or so. Add the stock, bay leaves, thyme sprigs, garlic and tomatoes with their juices, and bring to a boil. 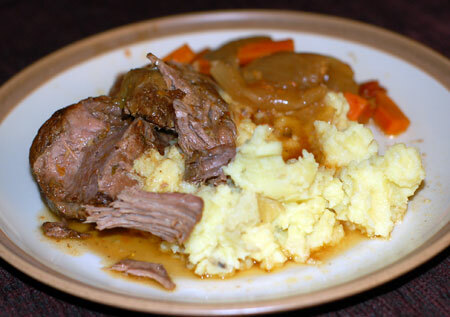 The braise: Return the lamb to the Dutch oven, and scatter the onions and carrots around the meat. Crumple up a piece of parchment paper and place on top of the meat and vegetables inside the Dutch oven, then cover with a snugly fitting lid. Place on a rack in the lower third of the oven, and braise for 6-7 hours, gently turning it over every 2 hours until the meat is butter-tender and falling apart. If you worry that your oven runs hot, or the liquid is at more of a boil than a slow simmer, turn the heat down to 200F after the first two hours. The finish: Carefully transfer the lamb and veggies to a platter and cover with foil to keep warm. Let the pan juices sit for a minute, then skim off the accumulated fat (there may be as much as half a cup or more). Bring the juices to a simmer over medium heat, skimming a bit more as the remaining fat coalesces on the surface. Taste and adjust for seasoning if necessary. Serving: Spoon some warm juices over the lamb and veggies. You won’t need to carve the lamb because it will be collapsing. Instead, serve with a meat fork and large spoon, putting a few veggies on each plate and spooning over a bit more sauce. Source: Adapted from All About Braising , by Molly Stevens (p. 426-428). Update 2/6/09: Jeremy requested braised lamb for his birthday, so I made this recipe again, and we had tons of leftovers, including about a quart of leftover braising liquid which was just too flavorful to toss out. I used it to make lamb risotto, and it was delicious. I just broke up some of the lamb and added it to the risotto with the remaining veggies, chopped up, some oregano and feta cheese. Great way to use up the leftovers! 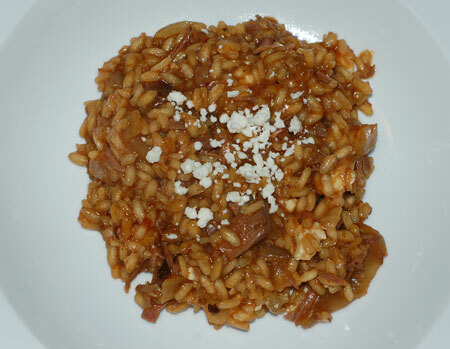 I should also note that risotto was a great meal for Nolan, lots of soft rice and spoon-tender meat and veggies. Looks like a fantastic recipe. I love that cookbook, and I love lamb, so saving this recipe right now to del.icio.us. Kalyn, it was delicious. Let me know if you try it out!